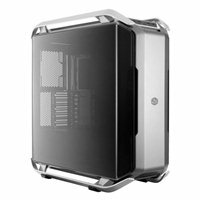 COSMOS cases made their name because of the unique and bold exterior, the premium materials and the ample space to build a dream machine. COSMOS C700P carries the classic design elements of the COSMOS line (aluminum handlebars) and combines them with more innovative technology than any other case to date, originating from the MasterConcept 2.0. Everything about this case is subtle and refined. There are recessed RGB lines carved into the top and bottom accent of the aluminum and glass which make the case look out of this world, without overpowering the look.